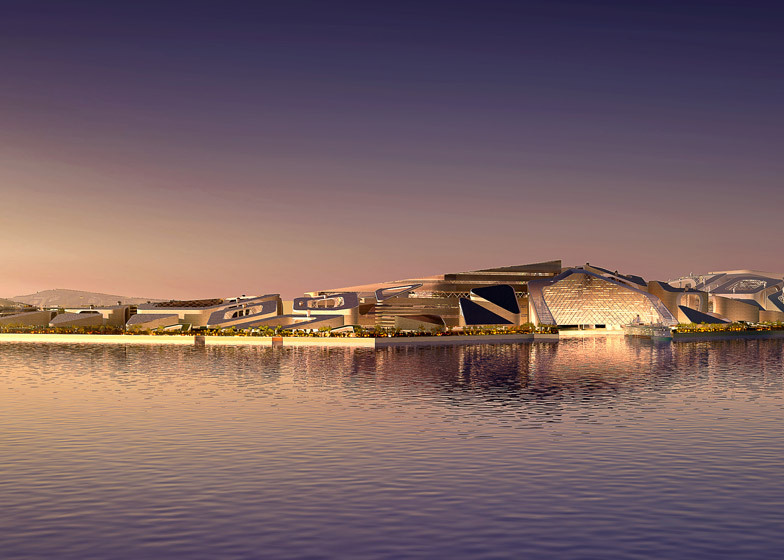 Architects have started to embrace the idea of learning how to work with water rather than attempting to fight against it and so we’ve rounded up some stunning examples of these developments. Floating architecture is growing in popularity quickly in the Netherlands, as climate change threatens this country whose landmass is largely below sea level. 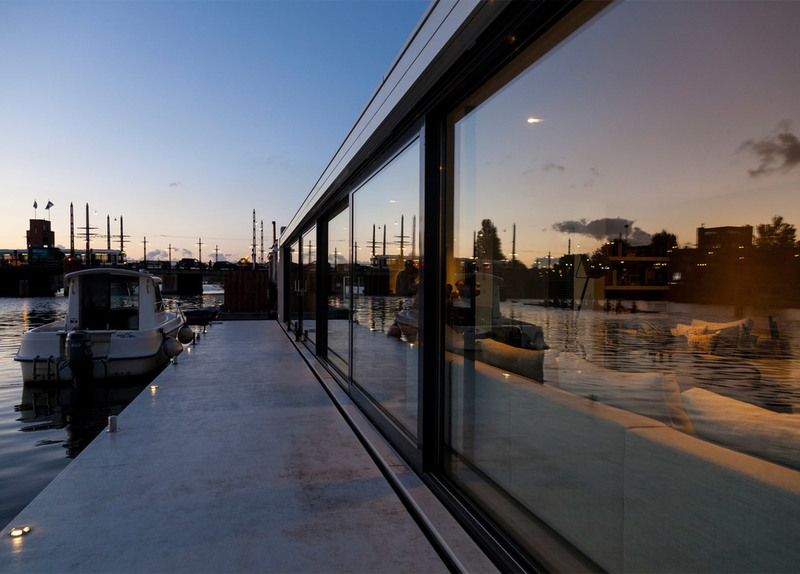 Designed by +31 Architects, this houseboat or ‘Watervilla Weesperzijde’ takes its design from that of a ship, half submerged below the waterline. The aim of the design was to create a feeling of being on holiday and to reconnect man with nature; the space opens out onto a buoyant terrace which spans the length of the living space, its sliding glass doors maximise the view of the river and surrounding scenery, and the entire space is open and airy with the pale grey flooring of the living space and terrace appearing to merge into one space. Its external features include three automated sun awnings on the roof which are retractable by the push of a button, a wooden bridge connecting it to the quay, and perforated aluminium sheeting decorated with the house number and illuminated by a panel of blue LED lights at night. The interior features a floating staircase, leading to the windowless basement area in which there are a set of bedrooms, bathrooms and a small additional living area. It is also flanked by glass balustrades which bring light down into the open plan lower level. 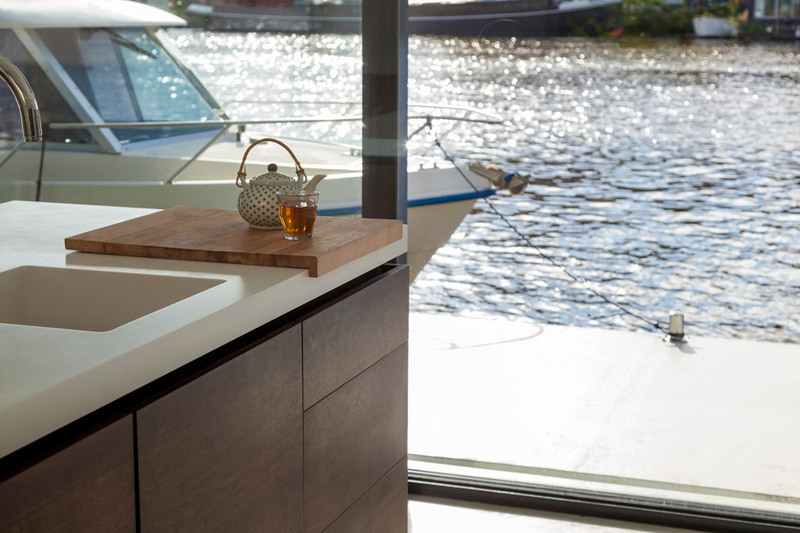 In a concept that has been given the name ‘Aquatecture’, Baca Architects have completed the UK’s first adaption of floating housing on the River Thames in Marlow, Buckinghamshire. Designed to float up with the water level in the event of a flood, the house features zine tiles, full-height windows and is described as working like the hull of a ship. Its buoyant concrete base sits in a wet dock which has a permeable concrete bottom, so that when water goes in, the house rises with it. Guided on four fixed steel posts, known as ‘dolphins’, the house can rise up to 2.5 metres - much more than the projected future flood levels for that area. 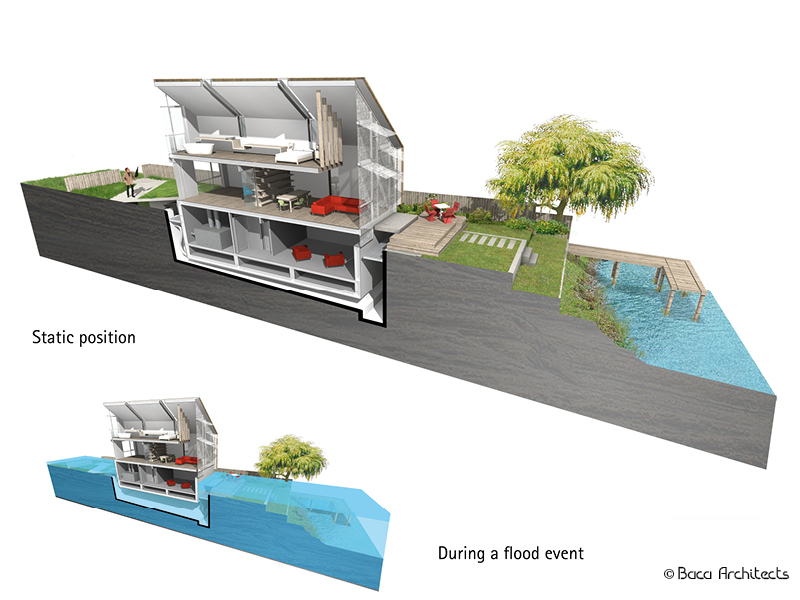 Services are fed in through flexible pipes so that the house remains ‘plugged in’ throughout movement, and the garden space has been designed to act as an early flood warning system, consisting of three stepped terraces which will slowly take on water in the event of the flood so as not to shock the inhabitants when their house suddenly begins to rise. Built for Thailand’s ‘Film on the Rocks’ Yao Noi Festival, this auditorium raft was created by Buro Ole Sheeren in 2012 and designed to float on the sea. On Nai Pi Lae lagoon, Kudu Island, it creates an atmospheric convergence of nature and cinematic narratives. 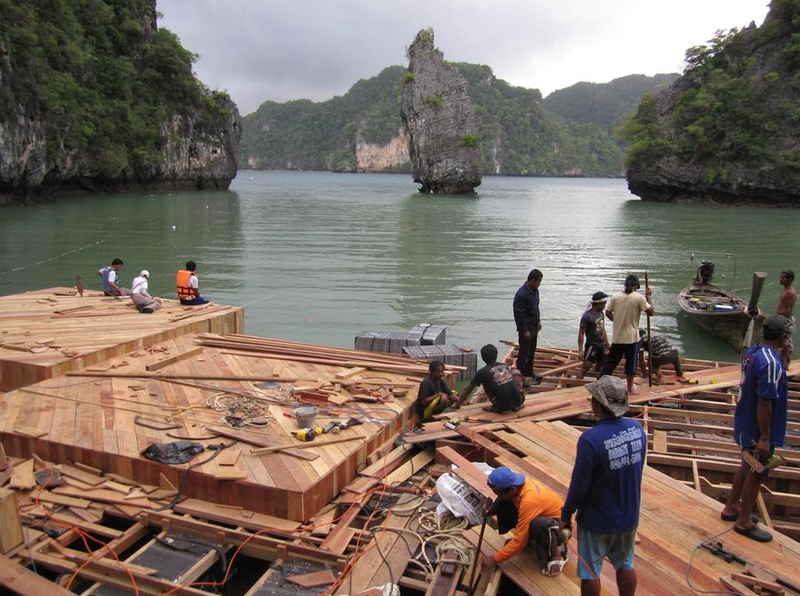 Based on techniques used by fishermen’s floating lobster farms, it was built using recycled materials, such as wooden frames tied together by rubber straps and foam blocks wrapped in mosquito nets. 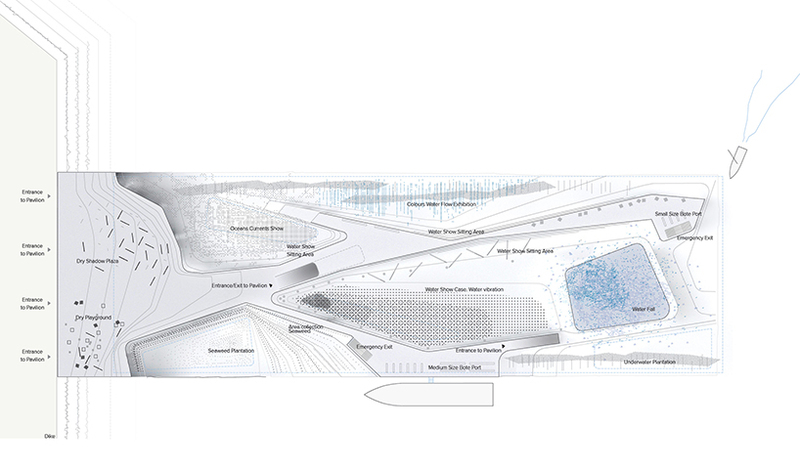 These materials give the structure flexibility for its future use, and it has since been given back to the community. Seoul is one of the most densely populated cities in the world and so developers there are now renovating unused urban spaces, such as the Han River which divides the city in half. Designed by Haeahn Architecture and H architecture, this floating city is part of what is called the Han River Renaissance - a scheme to program and stimulate water landscapes, which has the capacity to hold 700 people. It has several cultural, educational and recreational functions, with its design concept stemming from the stages of a blooming flower - seed, bud and blossom. 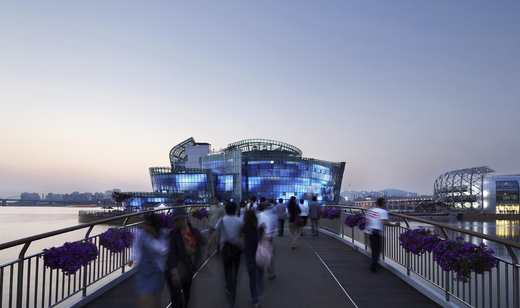 Made from structures of glass wood and steel, these ‘debit dungdungseom’ or ‘3 floating lantern islands’ feature a roof garden, a club house, a water slide into the river, sustainable septic and MEP systems to ensure the least impact on the water, an outdoor dance space, a multipurpose hall, observation deck and observation station, fritted glass façades and an extensive LED lighting system. Hasle Harbour is a local port for industry, fishing and ferry service, but it is being affected by changing transport routes and the declining fishing industry, so developers are revitalising it as a place for living and recreation. The harbour is known for numerous breakwaters to protect it from the surge of the Baltic Sea, but these obscure the horizon view and restrict sea access - aspects that they want to retain - which has driven the design of this new bath. 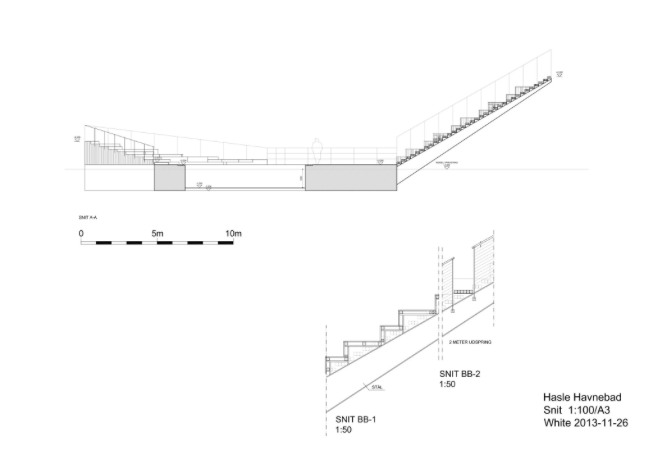 A floating platform is placed within the network of breakwaters, its horizontal plane featuring two stair formations projecting from its base (one reaching six metres in the air). This elevated level means the sea view can be enjoyed with no obstruction. The structure is clad with FSC-certified timber boards and a series of small wooden decks for seating which are available to the public. It offers both bathing in shallow enclosed basins and diving in deeper waters. A 25 metre ramp connects the bath to shore, and its slope changes with the water levels, enabling disabled users to utilise it in normal water fluctuations. Housing over 100,000 people, Makoko is a poverty-stricken, former fishing village where houses are propped up above the water on stilts due to no roads and no land. Architect Kunlé Adeyemi found a solution to this, building this three-storey school which sits on empty plastic barrels for buoyancy, and moves with the rising sea. 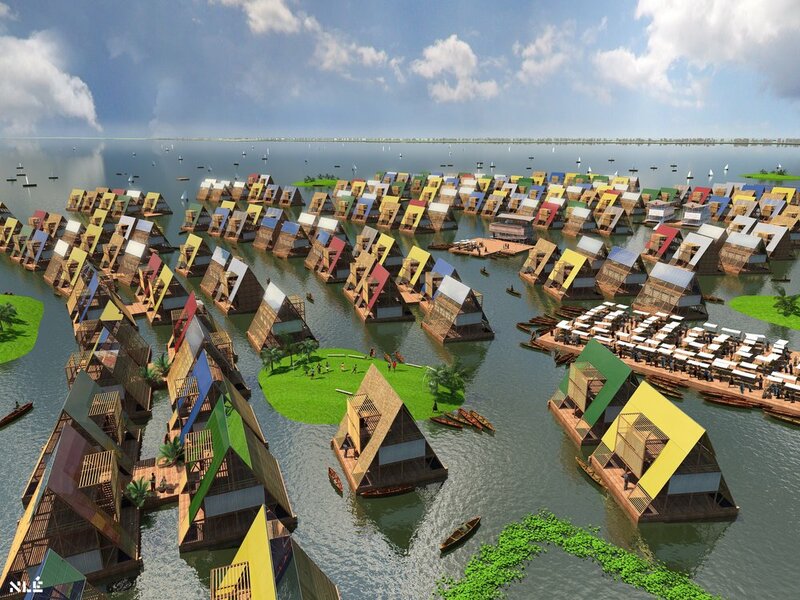 The project began in 2012 and aimed to give an education to residents of all ages whilst being a sustainable, ecological alternative building system for the people of Makoko. Adeyemi hoped to roll out this concept after trial, as because between now and 2050, Africa is predicted to house more than half the world’s population. The ground floor was an open space, designed to invite people in, the second floor was a classroom, and the third floor for heat ventilation. 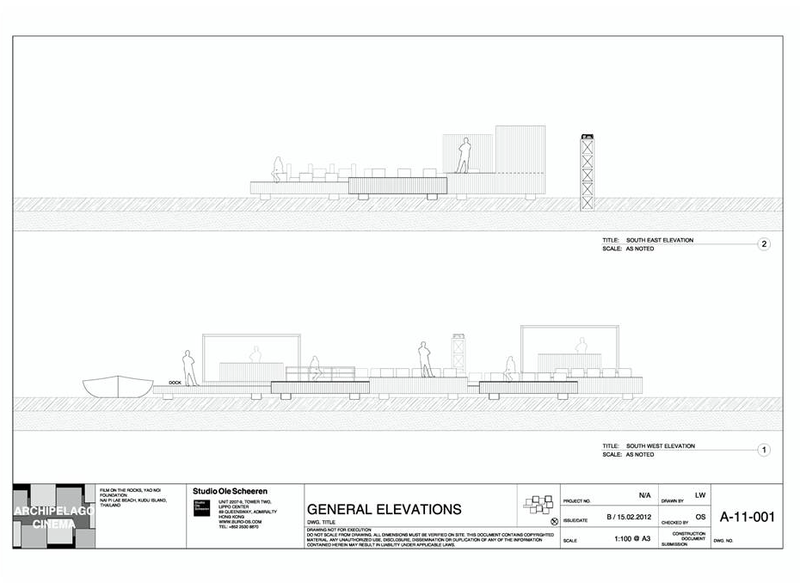 The final prototype was 1000 square feet and featured compost toilets, play areas, and could house up to 100 people. It was decommissioned several months ago and scheduled for demolition after 3 years of intensive use. 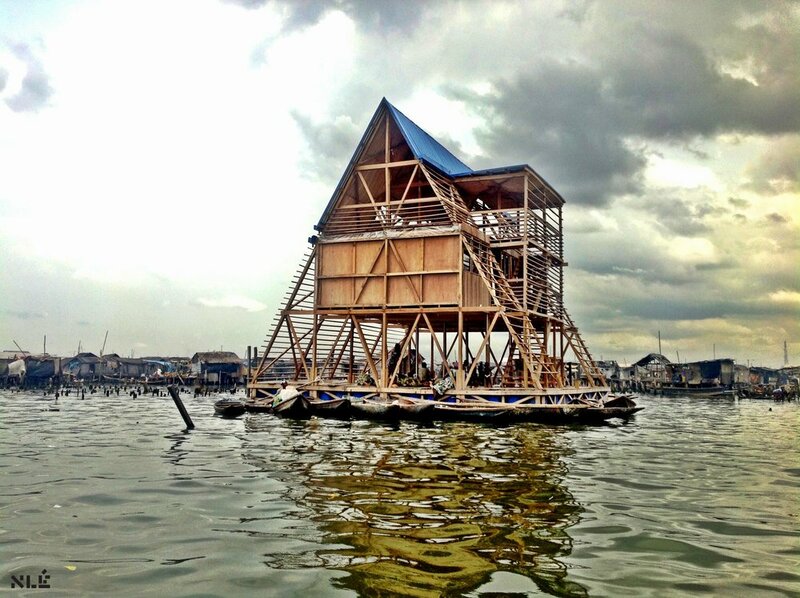 However, it recently collapsed following heavy rainfall and the structure was destroyed, but Adeyemi is currently planning a second iteration which was recently exhibited at the Venice Architecture Biennale. This new version features 256 plastic drums for its underbelly and is powered by rooftop solar panels. This concept is still only a proposal, but we think it shows great promise. It invites visitors to walk on water towards the ocean, and is constructed with the various movements of water in mind, demonstrating a range of formats. 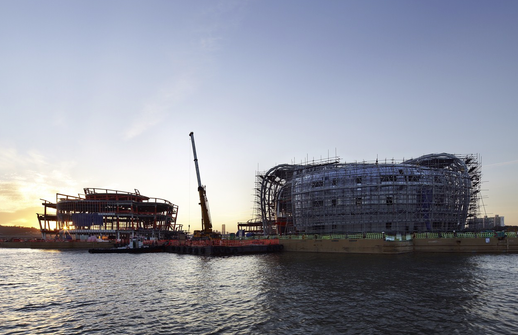 These include water shows, water screens, hydraulics, and a cooling system all built into cross-sections or ‘veins’ of the structure. It aims to raise awareness of the crisis facing ocean and coastal environments. Intentionally unstable, it sits between being emerged and submerged, similar to submarines, and its state of equilibrium represents the risk from global warming and rising sea levels. No foundations mean that it has flexibility like a boat and the potential to travel. It will include a water purification system that cleanses the saltwater into freshwater, and aims to reduce energy consumption to a minimum by using solar panels and a micro turbine to generate energy. 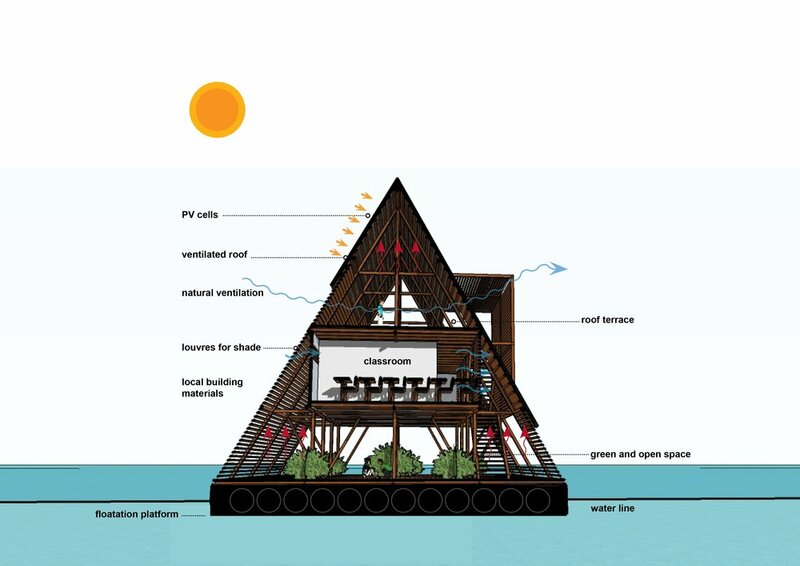 This proposal offers a sustainable and durable solution to traditional construction, as an alternative to destroying the Earth’s natural resources. This ocean metropolis was commissioned by CCCC-FHDI and its designers were briefed to create a floating island covering four square miles, using the same technology recently used to build a 31 mile long bridge between Hong Kong, Macau and Zhuhai, part of which is an underwater tunnel joined by a 150m long precast concrete box. 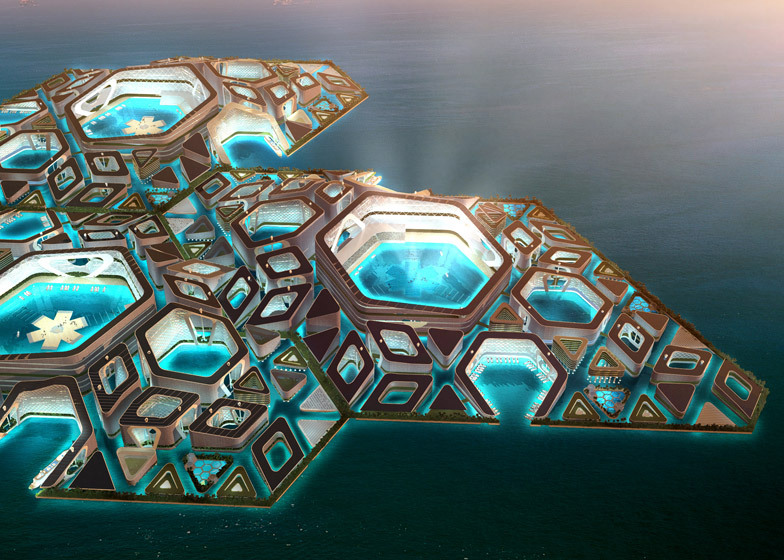 The proposal involves using series of prefabricated hexagonal modules that tesselate, to create an infrastructure suitable for a transport network of yachts and submarines, a floating hotel and entertainment complex, recreational green spaces above and below the surface, farms, hatcheries, rubbish collection facilities so the city can produce its own food and sustainably dispose of waste, and a cruise dock to allow for deliveries. It is zero-carbon, energy efficient and self sufficient, with components prefabricated in-factory and then floated out to site for assembly. The proposal was recently reviewed by one of China’s largest property investors and is likely to be tested on a small scale.